and to Lavi`s RCI- Pondichetty Cuisine conceptualized by Lakshmi. One of the most famous among chutneys in Tamil Cuisine is Kothamalli chutney. A simple preparation of ground fresh ingredients of coconut, cilantro, spices and a little extra tamarind to give it a tangy flavor~Amma`s kai vaidhiyam/ medicine for loss of appetite. In a blender grind 2 cups packed fresh coriander leaves, 3/4 cup grated fresh coconut, 3 to 4 green chillies, gooseberry sized tamarind and salt. Transfer to a container and serve with any South Indian Breakfast varieties like Idli, Dosai or Pongal. Increase or decrease the quantity of ingredients according to your taste buds. HAPPY MOTHERS DAY !!! Have a Great Weekend! Yummy chutney with that plate of idis..
the best combo ever. the idlis look so soft and fluffy. Like everyone else here, as much as I love kothamalli chutney, I am very much drawn to those soft white idlis that goes with it. THey look beautiful, do you use a grinder as opposed to a blender to make the batter? Just curious. Divya, I use the grinder for the batter. I am of the opinion the blender does not do a good job for idlis. Yummy chutney. 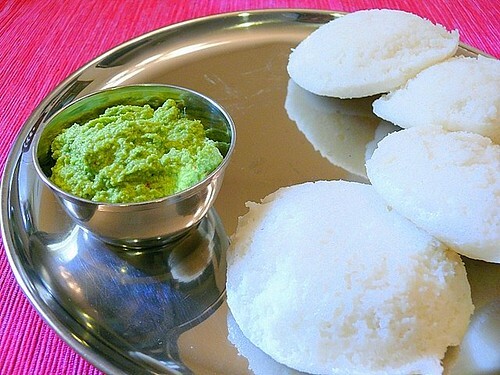 yummy idlis. good combination. Great combo, looks pretty the chutney! What i want to do is take a idlie and scopp that chutney looks so yumm. lovely chutney Cilantro ..Happy Mother's Day !! Very good snap! Happy Mother's Day! Happy mothers day Cilantro, feel like finishing the platter..looks yum!